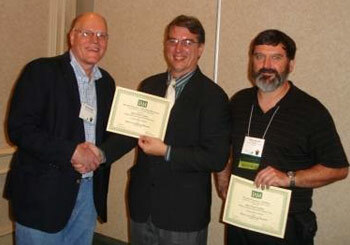 NIU’s Jack Olson Gallery earned top awards at the 2010 Illinois Association of Museums (IAM) conference, held Nov. 3 to Nov. 5 in Naperville. The gallery earned two Superior Achievement Awards tied to the “Crafting Maya Identity” exhibition. The Superior Achievement Awards goes to projects that are a model for the profession and reach a greater audience than is normally reached by the institution. The first award was in the Exhibits Category. The Awards Committee was impressed by the beauty of the exhibition, as well as by the integration of the exhibition content into the curriculum of various schools in the DeKalb, Aurora and Rockford areas. Students were brought to see the exhibition and the Maya woodcarvers visited the schools to discuss their art. Exhibition evaluations showed that the exhibition engaged the Latino community. The exhibition was curated by Mary Katherine Scott, an alumna of the NIU Museum Studies program and with a master’s degree in art history, and NIU art history professor Jeff Karl Kowalski. The exhibition was designed and installed by Olson Gallery Coordinator Peter Van Ael and his staff of undergraduate gallery assistants. Janie Wilson-Cook from the School of Art’s Visual Resources Center provided AV support. The second award was in the category of Scholarly Publications. The Awards Committee noted that the amount of time and research that went into the exhibition catalogue was incredible. The committee believes the book will be an important reference in the coming years. They noted its beauty, as well as the fact that it is a bilingual publication. The principal catalog text was written by Scott and Kowalski, and included additional essays on the intersection of tourism, cultural identity and art by Scott and Kowalski as well as by Janet Berlo, Christopher Steiner and Quetzil Castañeda. Kowalski also edited the volume, which was published by the NIU Press. The exhibition and related programming were supported by the NIU Foundation, The Elizabeth Allen Visiting Lecturers Endowment of the NIU School of Art, the NIU School of Art, the NIU Anthropology Department, the NIU Center for Latino and Latin American Studies, Target, and the Mexican Consulate in Chicago.